It was only the second time that we have played a two person texas scramble, and with less options and only 25% of the combined handicaps to come off the gross score, it looked like that scoring would be higher than in the four person version. But the father and son team of Dave and Ben Lloyd proved the exception, leaving the rest of the field more than seven shots behind with a fantastic score of 60.5. The only other time we have tried this format was in the first Anniversary trophy in 2011, and the winning score was 70.4! This format definitely favours a low handicap pairing – with a minimum of 7 drives each, many of the less able players were playing their second shots from strange places! I marked the winning card for the second week running (Kev Smith last week in the Apollo), so was able to get some photos of the winning pair. a more restricted follow through, but the same end result………..
Byron in blue with Paddy McKee and the runners up………..
another tricky pin position on hole 13……………..
Don’t forget the AGM next Wednesday – 7pm for 7.30 in the Skye bar. Next week is the March Apollo Air stableford. 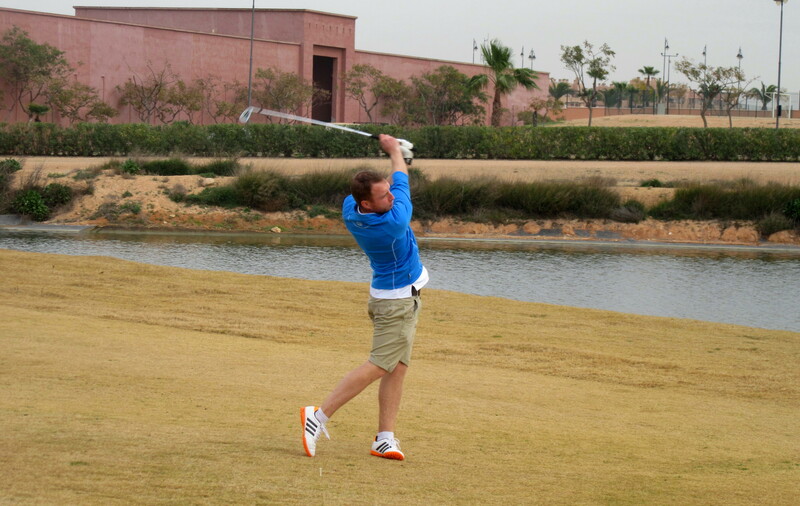 a splash of colour by the 10th tee…………………. the fields are full of spectacular views like this! Well, spring looks to be on its way in south-east Spain, with the wild flowers now in bloom along with the annual almond blossom display. It is still a bit chilly though so I abandoned my shorts for full length trousers, but I am sure they will soon be back permanently for the spring/summer of 2017. 48 players took part with two no-shows, and a couple of scores really stood out. Kevin Smith continued his fine form to reach 41 points, which was just enough to pip Norwegian Astri Spieler on the back nine countback. 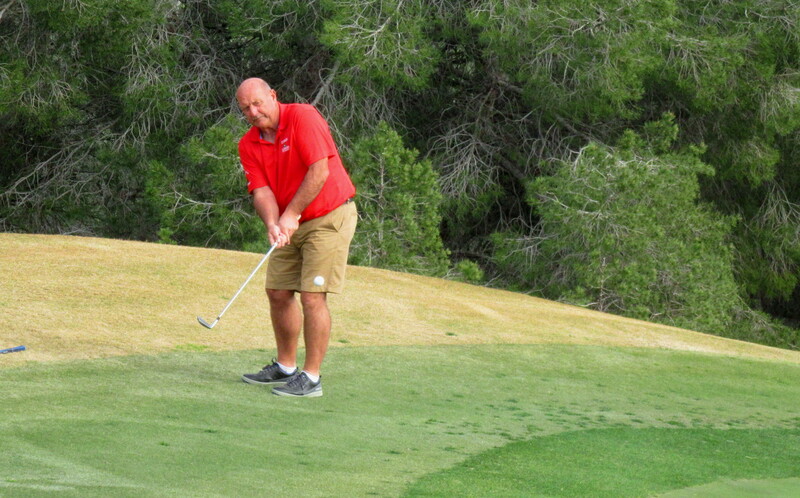 One notable achievement by the captain, Neil Simpson – he recorded the lowest stableford ever – 0 points! Once you tee off you are in the competition, and after 2 shots (still not on the green) he received a call from his wife Lynn – she had got her dates mixed up and she had to be at Alicante airport in 75 minutes! 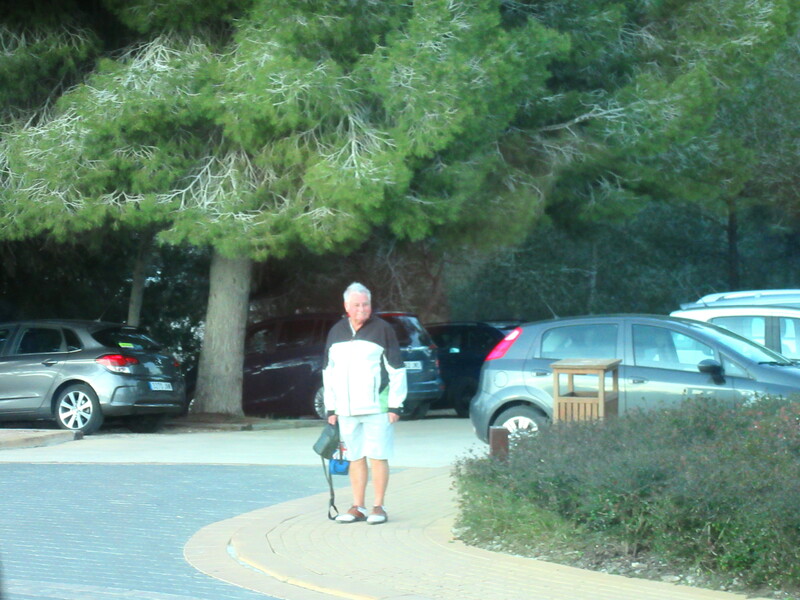 I drove him back to the tee, Jim Alwell took him to the car park, and he fought his way through traffic with 7 minutes to spare before the gate closed!……………………. A record that will never be beaten! Our thanks go to Eddie Reid, who has offered to continue with his sponsorship of a sleeve of balls to the divisional winners. being from God’s own country of Yorkshire, maybe some needed the translator above his head………………. 34 points was enough to claim the 2nd division on a very calm day…………………. Astri was so unlucky to lose out with a fantastic 41 points……..
And out on the course……………………..
a view from the back of the 15th tee over the 10th green – Bjorn & Astri Spieler and Jan & Eli Holdhus putt out……..
John Collins plays his 2nd shot to the 10th………….. The green keepers are working hard on the course. A lot of the rough areas just off the fairways leave a lot to be desired. Here is a view of the 14th with the offending area rotovated. There were 4 green keepers on the 13th shovelling away the soil to leave a smooth surface, and work has been started on the 15th also. this work should improve the playability of the course…………. On a maternity room door – push, push, push………. At the opticians – if you can’t see what you are looking for, you’ve come to the right place…………. The car showroom – the best way to get back on your feet……….miss a car repayment. Exhaust centre – no appointment needed…………….we hear you coming! at the vets – back in 5 minutes………..Sit! Stay! The annual captain v President challenge was again a keenly fought affair, with Dave Lloyd (President) just coming out on top by 6 wins to 5. 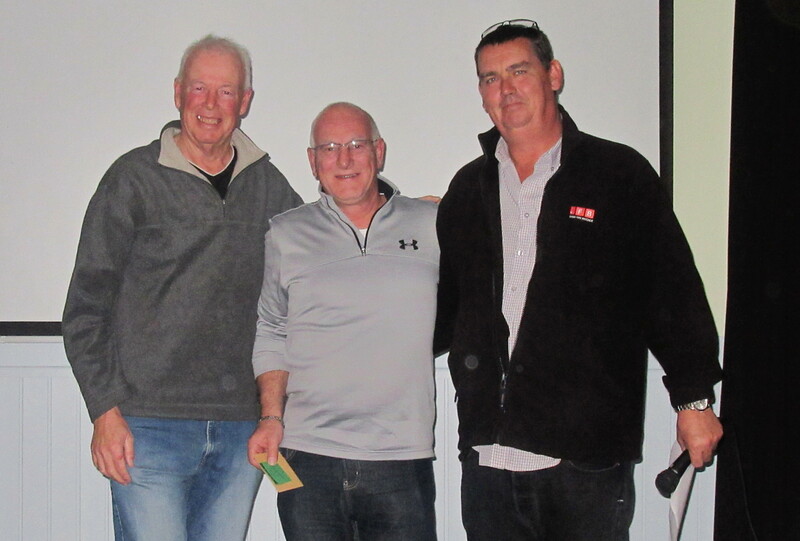 It was a betterball competition with the pair with the best stableford score gaining a point for the team. Lots of good scores with the majority reaching at least 40 points. 43 players today with just one no show. 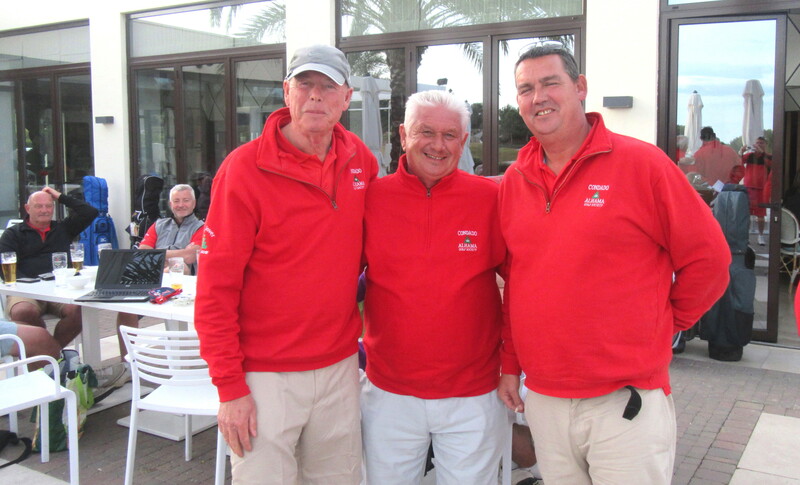 Jan & Dave had a fantastic score…………………..
Colin and Dave flank the defeated captain………..
And a few photos from on the course……………..
winner Sausage silhouetted against the Sierra Espuna………. Gunnar Sten Larssen also has an elevated view of the 8th green…..
Tuesday is the deadline for applications for positions on the committee – the list is in the golf shop. Also any proposals to be discussed at the AGM should be given to any committee member by that date. The AGM is in the Skye Bar, 7pm for 7.30pm Wednesday March 3rd. Next week is the February Apollo Air stableford. We have an ageing population on Condado (more qualifiers every year for the seniors trophy!) so maybe these may ring a bell? Funny, I don’t remember being absent minded…………..
It’s hard to make a comeback when you haven’t been anywhere……. If God wanted me to touch my toes, he would have put them on my knees………………. Old people shouldn’t eat health foods………..they need all the preservatives they can get. a first class club house and golf package………. 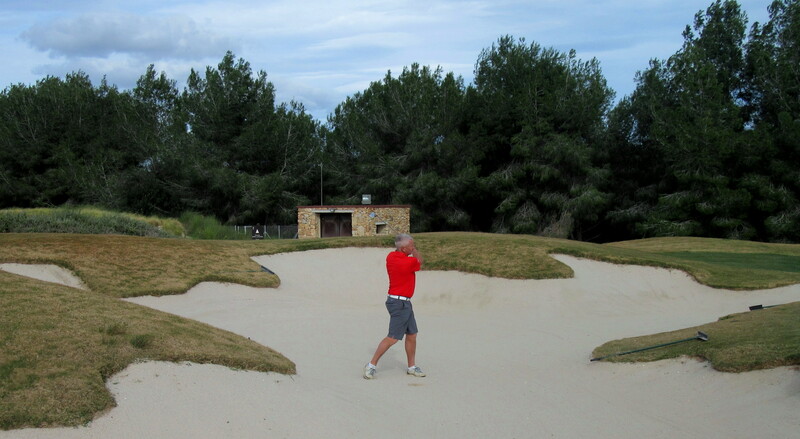 After a great visit to Las Colinas last year, we decided to try it again. 40 golfers, and about 15 lady shoppers took advantage of the free coach arranged by the social secretary (Alicia Saunders). She also prepared a bag of food and drink for each golfer to take with them onto the course. Maybe the course wasn’t as good as last year, but everyone enjoyed the challenge. Just about every player accepted they had a bad day, but didn’t realise that everyone else had the same experience. It was a qualifying event, so absolutely everyone got 0.1 back onto their handicap! Jeff’s 32 points was good enough for 1st prize, and he gets 0.1 back as well! well done Dave, your back must be aching! 25 points for 1st prize?……..
Anthony’s 25 points got cash………..
Ian looks suitably embarrassed to take the money…………. Les wasn’t embarrassed at all……………………..
my 24 points usually gets me into the relegation places………. winners couldn’t get 2 prizes so the aggregate went to Lynda………………. 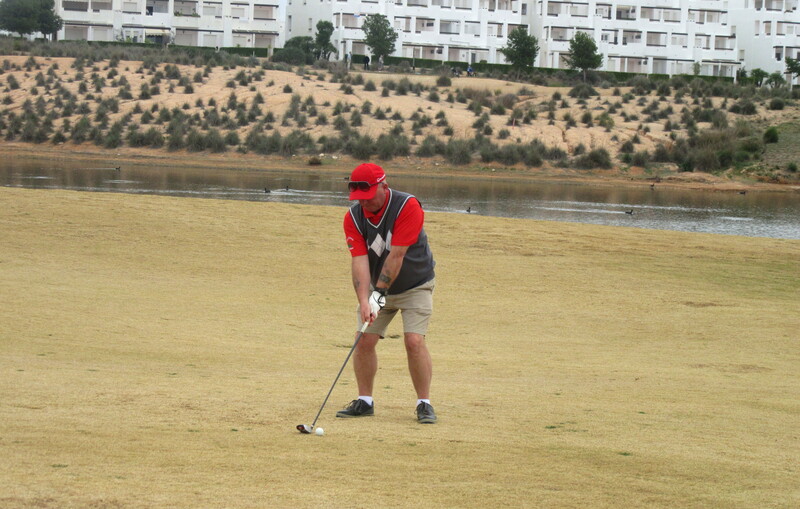 and from out on the course………………………………..
Chris McAllister is usually round about the prizes, but this was not his day………..
and this is my action shot……….on the 1st! Captain Neil asked who thought that they had NO chance of a prize………..looks like everyone had a bad day! Well, someone had to win, and 25/24 points was good enough! Don’t know what the reason was for such low scores, nothing obvious like wind, rain, pin positions etc. Then the ladies returned from their shopping trip and time for everyone to get back on the bus. Poor Barry Answer looks like a little boy lost as he watches us go – he was on his way home to Mansfield via Alicante airport…………. Another good day, here’s to the next one! the grass must be growing! Sprinklers on hole 16……………. The first major trophy of the year attracted 63 competitors and 3 guests, and at first it looked as though the strong wind would affect scoring. 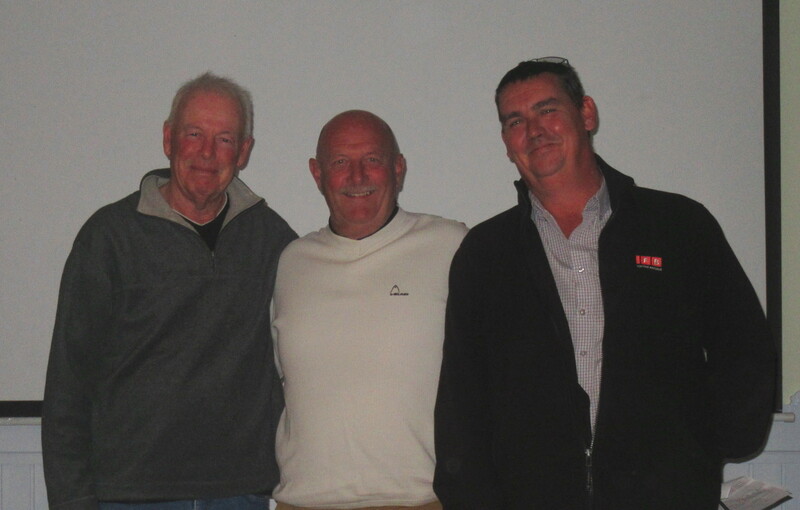 However, the pairing of Mick Parsons and Rob Busby left everyone in their wake with a fantastic score of 48 points. It was the second time Mick has won this title, and he is the first to win the same major twice. 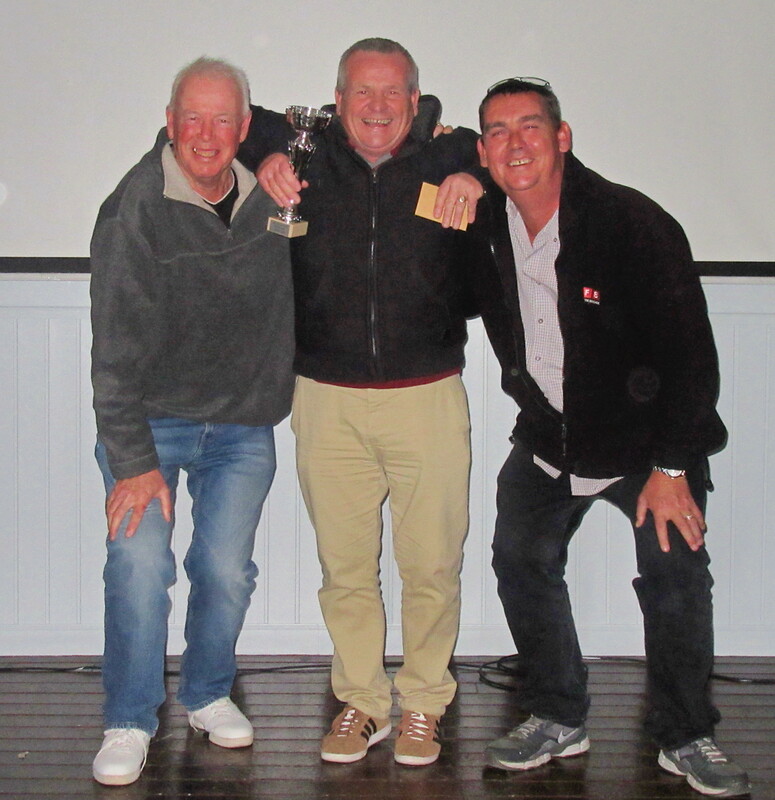 Rob and Mick were this year’s champions……..
Dave and Jim had to settle for 2nd place………..
Dave was nearest in two on the 8th…………. 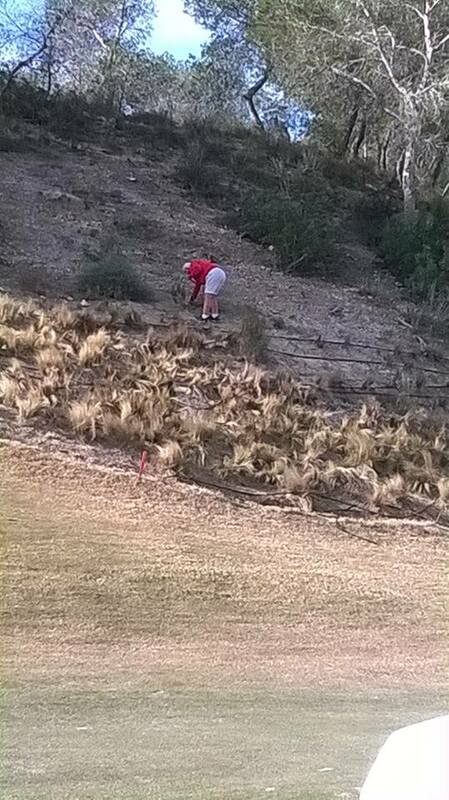 ‘city Dave’ was nearest the pin on 17…………. 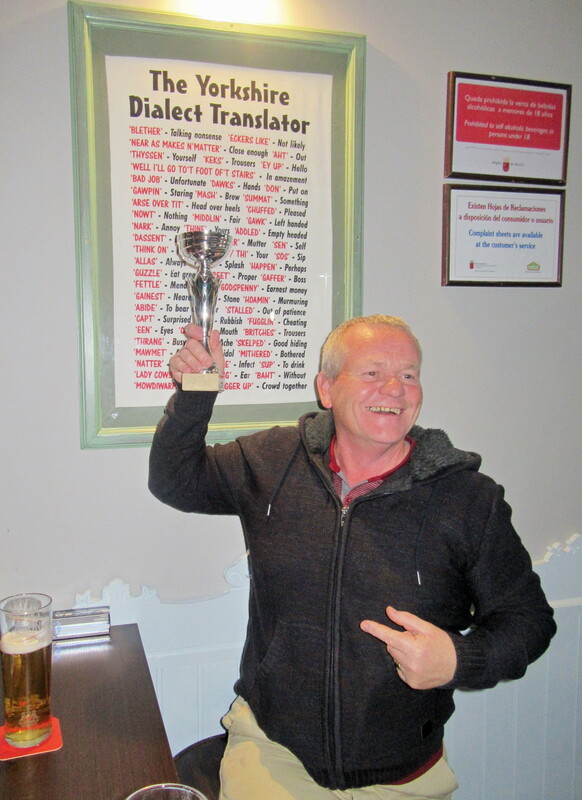 Ben Lee looks happy with the guest prize!……. this wasd a prize Lynda and Torild didn’t want – the booby prize for last place….. The evening presentation was at Camposol golf club, and the guests enjoyed an excellent carvery followed by a disco presented by Byron. .But not all Barry’s holes were as good………………..
more trouble on the 5th………………..
Then he realised I wasn’t going to help him so he had to improve to avoid the booby prize…………………………….. Bus leaves Al Kasar 8.30. First tee time 10.30. €60 (collected on bus) incl Buggy, practice balls, drinks voucher at end of game. You will also get a pack lunch supplied by social side of society. Prizes will be funded by complimentary places. First, second and third in each of two divisions. Nearest pin and aggregate par 5s and 3s. We know the groups but playing order will be drawn on bus journey. Please wear a red polo shirt if possible. Next week is the annual challenge between the Captain’s and President’s teams.